Many brain functions such as arousal, control of pituitary hormone secretion, suppression of eating and cognitive functions are seen in the central histamine control system. Old terms coined by Dr. Pfeiffer regarding undermethylation and overmethylation, are respectively histadelia and histapenia. 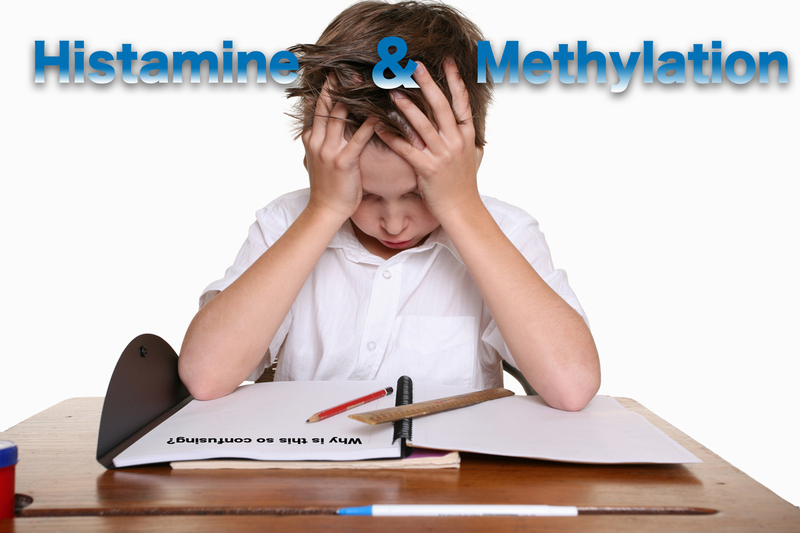 Histamine, dopamine, serotonin and norepinephrine profoundly effect the methylation status in the brain. Marked depletion of brain histamine is associated with overmethylation (hypermethylation). However, this is not to be confused with systemic regulation of histamine as a response to chronic allergic / sensitivity reactions. Brain regulation of histamine is crucial to functional balance of the neurochemistry. It is interesting to note that histamine is a strong promoter of the inflammation cascade, including mast cell activation and T cell responses and with prolonged histamine reaction and chronic inflammation, histamine presence in the inflamed environment becomes depleted, thereby, causing hypermethylaiton (overmethylation). Also, high brain copper will also have this effect on brain histamine and neurotransmission. This will lead to neurotransmitter maladaptation and will have pronounced effects on dopamine, serotonin and norepinephrine. The effects of neuronal histamine are mediated via G-protein-coupled H(1)-H(4) receptors. The prominent role of histamine as a wake-promoting substance has drawn interest to treat sleep-wake disorders, especially narcolepsy, via modulation of H(3) receptor function. Post mortem studies have revealed alterations in histaminergic system in neurological and psychiatric diseases. Brain histamine levels are decreased in Alzheimer’s disease patients, whereas, abnormally high histamine concentrations are found in the brains of Parkinson’s disease and schizophrenic patients. Low histamine levels are associated with convulsions and seizures. Both of these extremes in histamine can be linked to the inflammatory cascade and cycle. Sensitive histamine extremes are causative factors in hypermethylation and hypomethylation, both are undesirable events. The brain often encounters sensitivity that may induce hypermethylation provocation, significantly influencing neuronal synapses unfavorably and if prolonged neurodegenerative damage. However, hypomethylation (high brain histamine), though not as frequent in the brain, can cause significant neurodegenerative changes as well as seen in Parkinson’s. The release of histamine is altered in response to different types of brain injury: increased release of histamine in an ischemic brain trauma might have a role in the recovery from neuronal damage. Neuronal histamine is also involved in the pain perception. Histamine may be a nuisance creating terrible reactions and allergy systemically and also causing prolonged inflammatory response. However, it is a key neuro-regulator! To conclude, I believe histamine to be a good indicator of methylation status in the brain. However, the challenge is whether our current assessment lab tests reflect true brain histamine values. Serum testing of histamine has its limits and I do not believe reflect accurately. Histamine degradation tests, mast cell analysis and urinary and saliva neurotransmitter tests are useful in assisting in profiling histamine. Brain MRI and histamine tracking have been accomplished as research, giving a general idea of distribution patterns. However, this is not a current option in determining histamine’s overall brain effect. These efforts combined with genetic testing and predictive patterns observed functionally with histamine for now give us a useful but limited picture. Depleted brain and CNS histamine indicate hypermethylation (over, high). Depleted histamine in other areas of the body can indicate the same. However, chronic histamine activation resulting from antigenic challenge and exposure can lead to over production of histamine systematically and cause hypomethylation (low). This chronic activation can facilitate faulty histamine metabolism causing depletion. Mast cells respond to histamine signalling and with chronic activation disturb the immune system leading to continuous hypersensitivity and over time autoreactivity. My theory is overactive histamine causing excess mast cell activation can lead to depletion resulting in hypermethylation in brain. Elevated blood histamine does indicate hypomethylation. The brain is sensitive to these changes and the blood brain barrier is involved minute interferences. The key here is brain sensitivity to depletion that results in high demand of histamine below the blood brain barrier (BBB). Just because whole blood histamine is high below BBB (system), doesn’t indicate that the microcirculation of the brain has high levels of histamine. This shunting system that is responsible to maintain homeostasis is intricate and will redirect which can for survival and adaptation result in preservation. An example of this is in fight, fright flight reactions the signals of the body move the blood supply to the core of the body for emergent threat and survival and this signal redirects the blood away from the periphery and surface of the body to guard against shock! Such redirecting of histamine can cause these sensitive changes in methylation leading to either extreme. Powering Up My Healthy Genes! Interesting information. I’m wondering if there is any research, complete or ongoing, as to how anti-histamines affect brain function and neurotransmitters. Never thought of the BENEFITS of histamine. Interesting observation.